(Due to the popularity of Tiger Woods, many kids are now taking up golf. What is Golf? - Golf is a game that steadies your nerves, toughens your muscles, improves your health and increases your stamina so you're strong enough to play again next week. Price/Stern/Sloan Publishers, Inc. Los Angeles, CA. Golf was invented in Scotland on October 3, 11:06 at 11:15 am. 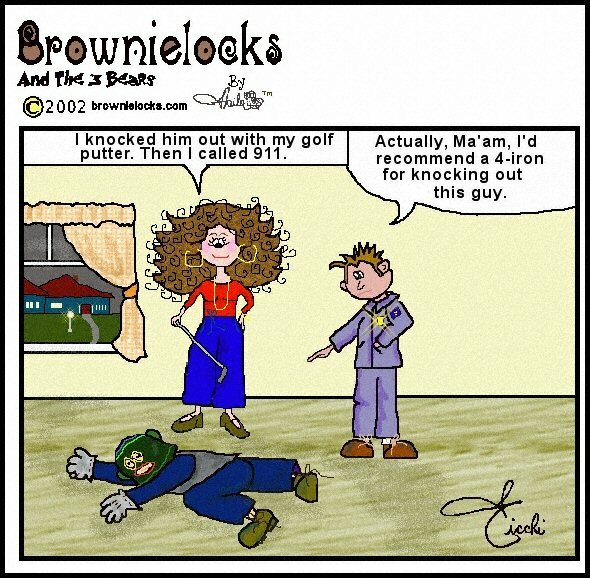 The very first golf joke was created at 1:30 the same afternoon. In 1457, King James II banned "golfe" (as well as "futeboll") because it's popularity threatened the practice of archery for national defense. And even today, hubands still suffer the slings and arrows of wives who don't quite get the essence of golf. Incidentally, there are 10,000,000 golfers in the United States and only 9,999,999 balls in play. Which explains why at even given tournament there is always somebody who is looking for their lost ball! I love to play golf. I get to hit the ball more than anybody else. You can always tell and boss and an employee who are golfing. The employee is always the one who makes a hole in one and says, "Ooops!" Two can live as cheaply as one can play golf. You can always tell the golfers in church. When they put their hands together to pray they use an interlocking grip. My doctor told me to play 36 holes a day. So I went out and bought a harmonica. You can always tell when the boss retires. That's when more members of the staff start to beat him. Duffer: I'd move heaven and earth to break 120. Companion: Work on heaven. You've already moved enough earth. Club Pro to two women: Would either of you ladies like to learn golf? One woman: Maybe my friend would. But, I learned it yesterday. The duffer wasn't doing to well and his caddy was chuckling quietly. Duffer: If you laugh again, I'll knock your block off! The duffer swung at him with his club and missed. A handicapped golfer is one who plays with his boss. By the time a golfer can afford to lose balls, he can't hit that far. This golf course is so small you don't yell "Fore!" You only yell 3 1/2. I don't really cheat at golf. I play for my health. And a low score just makes me feel much better. and business at the golf course. but at home he's unable to take out the garbage. Caddy, can you find balls in the rough? Good, find one and we'll get started. Your first day on the course? How did you do? I shot a 68-- and tomorrow I play the second hole. Caddy, why do you keep looking at your watch? It's not a watch sir, it's a compass. Please, let me play through. The battery on my golf cart is running down. You're absolutely right. I'm sure glad I don't have to play again until tomorrow. Caddy this is the toughest course I've ever played. How can you tell, sir? You haven't been on it yet. I gave up fishing for golf --- and I like golf much better. When you lie about golf you don't have to show anything. Doctor: I'm afraid you're very run down. I suggest you lay off golf for a while and get a good day in the office now and then. Caddy, this is a water shot. Give me an old ball. Begging your pardon, sir, but you've never had a ball long enough for it to get old. You stupid idiot! You almost hit my wife with that ball!! I'm sorry, old chap. Here, take a sot at mine. How does one meet new people at this club? Just pick up the wrong ball. If I were you, I'd play golf for my health. But I do play golf, doctor. One more bad shot will drive me crazy. You don't need a drive -- a short putt will do it. I've suppose you've seen worse golfers in your time, caddy? I suppose you've seen worse golfers in your time, caddy? I heard you the first time. I'm just trying to remember. Did you hear they've got a new formula that can grow hair on a golf ball? Nah, it slows up the game too much. My doctor says I can't play golf. He say you at the office? Nope, he saw me here on the course. Ok, OK, so you got a hole in one on the first green. Now what's the bad news? I shot 139 on the other 17. New Golfer: I want to be a golfer in the worst way possible. Look, you're the Pro. Tell me what to do about my game. I got some new golf clubs for my wife. Gee, that's great. I wish I could make a trade like that. Tell me Reverend, is it a sin for me to play golf on Sunday? I've seen you on the course, my son, and it's a sin for you to play any day of the week. Fellow was playing with the Archbishop and he noticed that before every shot the Archbishop would pray. Would it help me to pray, father? Because you're already a lousy putter. Why is it tough for ministers to play golf? They don't have the vocabulary for it. What can I do to prevent topping the ball when I swing? You're the Pro. How can I cut down on my strokes? Say, I think we should be getting closer to the club house. We seem to be running over more golfers than the cart. I'm sorry, sir, we have no time open on the course today. Wait a minute, what if J. Paul Getty and Howard Hughes showed up. I'm sure you'd find a starting time for them! Of course we would, sir. Well, I happen to know they're not coming, so we'll take their time. The golfer was sentenced to be hung. Do you mind?, he said as he climbed the scaffold, if I take a few practice swings. Sign on Scottish Hills Golf Club: Members will refrain from picking up balls lost balls until they have stopped rolling. Could you turn up the sound a little? Sh-h-h-h-h-h-h-h, not while Tiger Woods is putting. I don't get it Charlie. First you slice the ball into the bushes, then across the highway and then you lose it in the woods -- and you insist on finding it? I have to. It's my lucky ball. That's the 14th time I swung at the ball and I haven't hit it yet. Keep swinging... I think you've got it worried. First Psychiatrist missing 2" putt: Nuts! Second Psychiatrist: Cone now, Harry, we agreed not to talk shop. Doctor: The baby got into my golf bag and swallowed all my tees. I'll be right over. What are you doing in the meantime? The first time on the golf course the novice hit the ball with a mighty swing and by some miracle, it landed in the cup for a hole-in-one. On the second tee, another hole-in-one. As the ball disappeared into the hole, he turned white and trembling and said, "Gosh, I thought I missed it that time." Golfer: Watch my swing! I don't think I'm playing my regular game. Caddy: What game is that? This is the first time I've played with a caddy who's only six's years old. You'll be crazy about him...he still can't count over ten. My wife says if I don't give up golf she will leave me. but I blew it all on the fourth! 1st Golfer: Why are you late? 2nd Golfer: I had to toss a coin between church and golf. 1st Golfer: Then why are you so late? 2nd Golfer: I had to toss 17 times. John, you promised to be home at 5:00 pm. It's now 9:15 pm. Honey, please, hear me out...old Charlie died. He dropped dead on the 8th green. I've been taking golf lessons...spent $3,000 already. That's a shame. You should call my brother. Is he a golf pro? No, he's a lawyer. He'll help you get your money back. Bride: Harry, this was our wedding day. I've been waiting at the church for over 2 hours!! Golfer: Honey, I told you...only if it's raining, only if it's raining. 1st Golfer: It's so nice of you to come to the funeral. 2nd Golfer: It's the least I could do. In 4 more days, we would have been married 36 years. 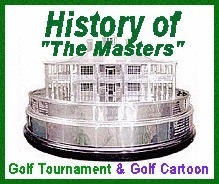 The following jokes are from "The All American Joke Book"
A group of golfers were telling tall tales. At last came a veteran's turn. "Well," he said, "I once drove a ball, accidentally of course, through a cottage window. The ball knocked over an oil lamp and the place caught on fire." "Oh," said the veteran. "I immediately teed another ball, took careful aim, and hit the fire alarm on Main Street. That brought the fire engines before any damage was done." Golf is a game where when you don't succeed, you try try again. And, if you're honest, you mark it down on the golf card. When you putt well, you are a good putter. But when the other fellow is putting well, then he HAS a good putter. when he gets a hole in one. For information on other sports.